If you're desperately resisting the shift towards USB-C headphones, you'll probably want to pass on the new ChromeOS tablet set to be announced at the Made By Google hardware event tomorrow, October 9, 2018. The new device, dubbed Pixel Slate, can be used as a standalone tablet, or docked with a keyboard case and used like a laptop. It will also ditch the 3.5mm port in favour of USB-C earbuds and wireless audio gear, new leaked images confirm. Google dropped the industry-standard 3.5mm headphone port from its Pixel 2 and Pixel 2 XL handsets last year – pushing smartphone owners to USB-C earbuds or Bluetooth headphones. Thankfully, a USB-C to 3.5mm jack adapter was bundled in the box to help ease the transition. The firm also unveiled its own first-party next-generation wireless solution – dubbed Google Pixel Buds – which promised hassle-free Bluetooth connections, as well as snappy access to the Google Assistant. The Pixel 3 and Pixel 3 XL are widely-tipped to include a pair of wired USB-C earbuds in the box, alongside the same adapter as last year. 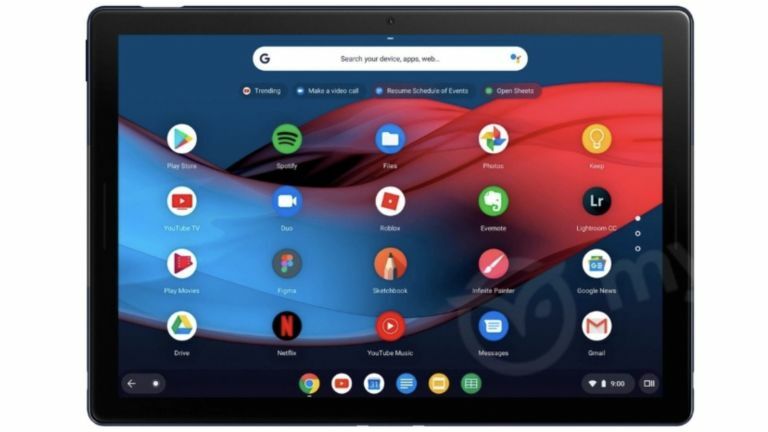 According to the latest leaks, Google's Pixel Slate, previously known under its codename "Nocture", will also forgo the 3.5mm port – something Google roundly mocked other companies for doing during its first Pixel launch. Elsewhere, the latest leaked images reveal the Pixel Slate will boast a 3:2 aspect ratio – a departure from the 1:1.41 aspect ratio used on the Pixel C.
The hybrid gadget will support a next-generation stylus akin to the Apple Pencil or Microsoft Surface Pen which will be used for notes, doodles and drawings. It also features front-facing stereo speakers, a fingerprint scanner, and cellular connectivity. Google Pixel Slate is tipped to ship in a variety of configurations, packing up to 16GB of RAM and an Intel i7 chipset, which should be more than enough to take on the likes of the iPad Pro and Surface Pro 6. The new set of images, posted by MySmartPrice, confirms the new keyboard case designed for the Slate will have round keys, like an old-fashioned typewriter. We will reserve judgement on these very unconventional keys until we've had a chance to rattle through a few sentences on the new keyboard cover, but it certainly looks visually striking. The Pixel Slate accessory has four pogo pins to transfer data to the tablet. There is a dedicated key on keyboard to launch Google Assistant, hinting at the importance of the AI-powered virtual assistant in this new gadget. Like Amazon's origami cases for its Kindle range, the top of the accessory can be folded to prop-up the Google Slate so that it can be used as a laptop replacement. We'll find out the rest of the details at the Made By Google event on October 9, 2018.